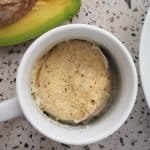 Did you know you can make keto bread in a mug? 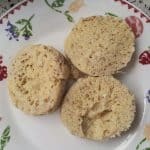 Keto mug bread is a staple in the keto diet. It’s quick and easy to make and delicious in sandwiches or as sides for other keto recipes. 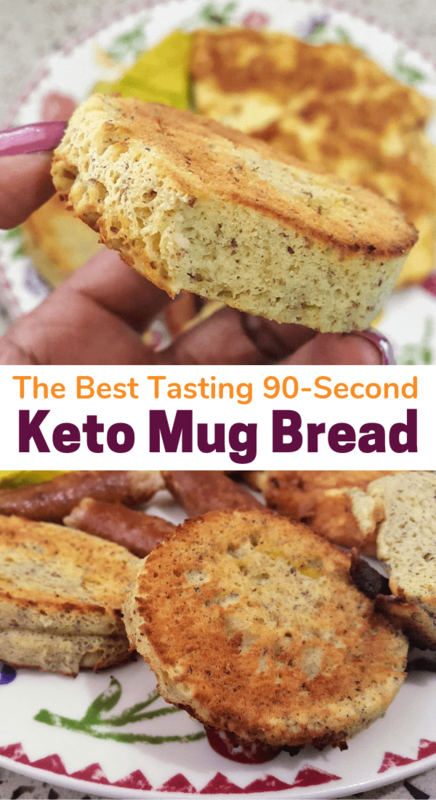 Try this 90-second keto mug bread with coconut flour or almond flour and our secret ingredient! It would be next to impossible for me to be successful on the ketogenic diet if it wasn’t for the quick convenience of keto mug bread! Bread is a hard thing to give up but thankfully this 90-second keto mug bread makes this carb swap a breeze. 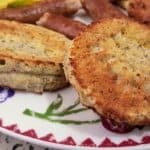 I’ve tried many different keto mug bread recipes and mixed and matched ingredients to come up with my perfect balance of taste, texture and cost. Flaxmeal is my secret ingredient in this 90 sec keto bread recipe. 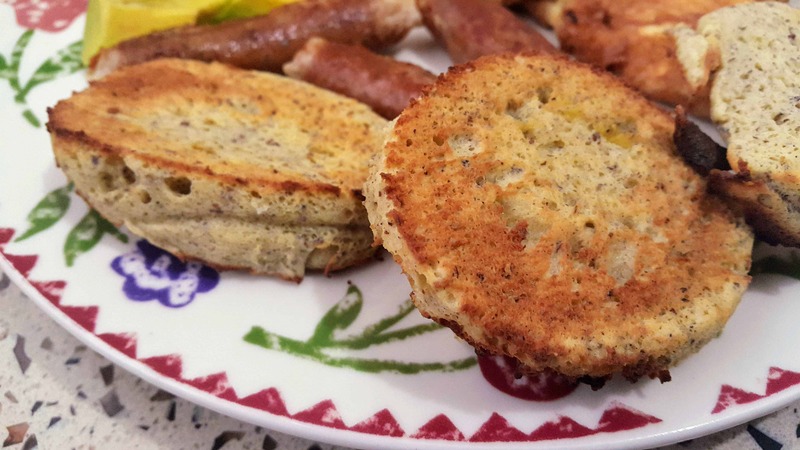 It gives it a firm but moist texture that is slightly bagel-like, perfect for biscuits and keto breakfast eggs. I also switch inbetween coconut flour and almond flour depending on the flavor I want and between adding heavy cream or sour cream as both give a different texture to the finished low carb bread. The recipe below uses coconut flour because of the cost effectiveness. Coconut flour is much more absorbent than almond flour which means you will need much less coconut flour to make your keto microwave bread than almond flour. Sour cream gives a light crumbly texture to this recipe and would also make a great low carb biscuit. Heavy cream adds a firm bagel texture making the bread perfect to sop up gravy dishes. The great thing about this keto microwave bread is how adaptable it is to whatever ingredients you have on hand. The staples in the recipe are butter or coconut oil, an egg and the baking powder. 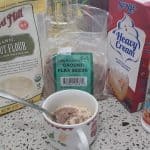 Outside of that, feel free to sub in coconut flour, almond flour, flaxseed meal or any combination of these flours to get the flavor you prefer. I’ve also added in cheese to the mixture and gotten a very firm, almost crispy biscuity-like result. 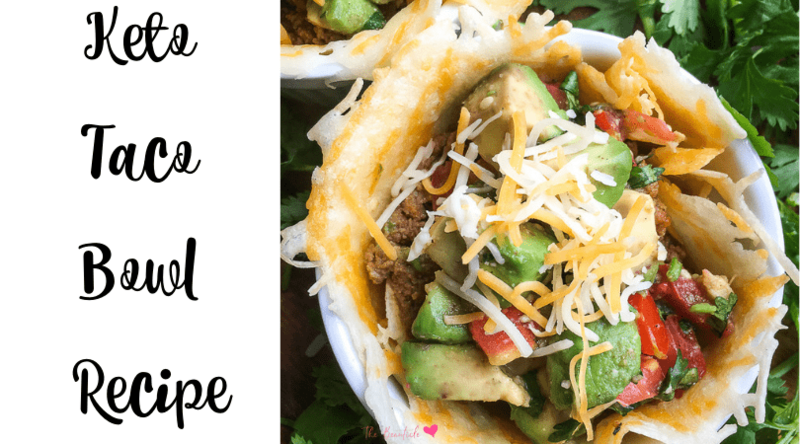 Recipes like these help me to switch up my keto diet and stay in ketosis without being bored. I love the convenience of a slice of toast with my morning tea and finding ways of making my favorite recipes low carb has been a game changer for me. It’s important to always test your level of ketones when trying new recipes as you never know what may knock you out of ketosis. This post goes into detail about how to test for ketosis. My favorite keto test strips help me to know what works best for my body as know two keto diets will be the same. Getting into ketosis and staying in this state is of course the main goal of the ketogenic diet. I detail how I get into ketosis quickly in this post whenever I find that I have been knocked out of this state. In order for our bodies to use fat as fuel instead of storing it, we must remain in a state of ketosis. 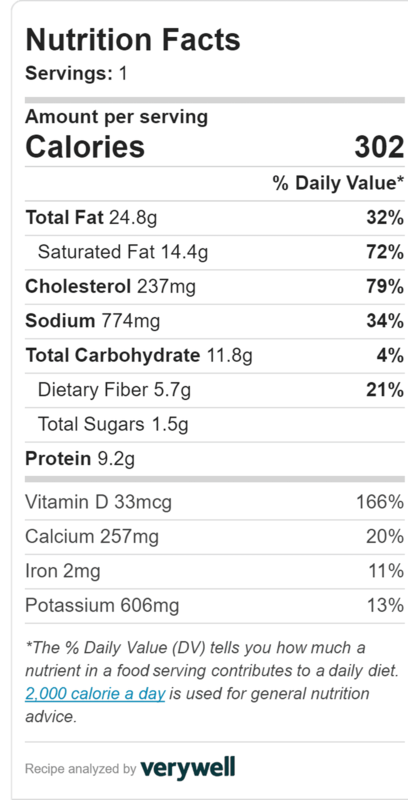 I also love using my favorite exogenous ketones to help me get into ketosis whenever I have a cheat day. These ketones have been tested by a ketogenic expert and have been found to be the best ones for the job. 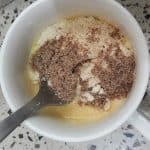 A quick keto microwave bread that is perfect for keto snacks or keto breakfast ideas. In regular coffee mug, whisk together butter, egg and heavy cream. Add remaining ingredients, mixing slowly with fork till all is combined. Remove from mug using butter knife to slide around edges. Optional: slice bread and toast. Coconut oil can be used in place of butter. I like to toast my bread after removing it from the microwave. It brings out the flavor that much more plus if there are any parts on the bottom of the bread not completely cooked, this will help to complete the process. I love this recipe! I tweaked it just a little , I used Almond Flour and I added a sprinkle of cinnamon and sprinkle of sweetener ,then I toasted it on a cast iron pan topped it with a smear of butter and WOW ! Great with my morning coffee !! I’m so glad you liked it Diana! I will try your spin on it, sounds delish!